While the US government prepares its report on commercial vehicle safety to be released in 2019, you can access a thorough analysis of that data NOW. 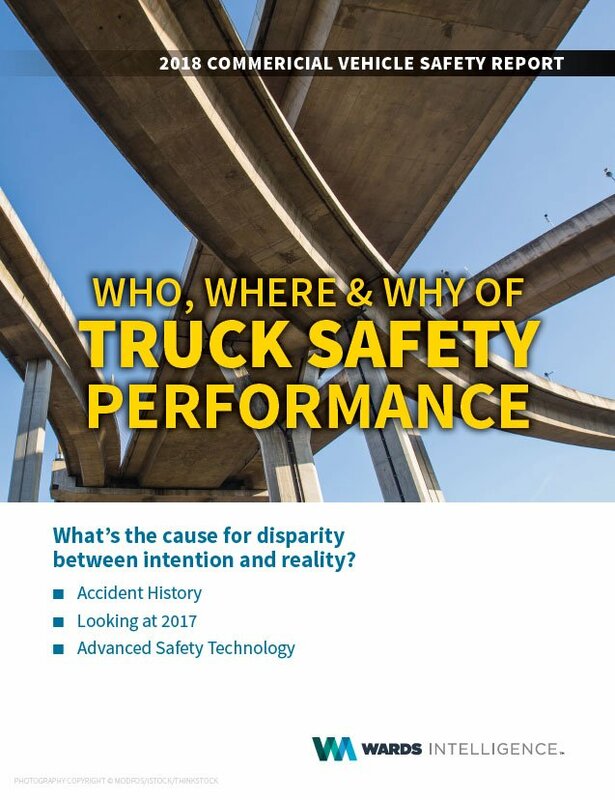 The just-released 2018 Commercial Vehicle Safety Report, the first of its kind from global leader in transportation business insights Wards Intelligence, analyzes the most credible public and proprietary data sources to bring an objective perspective to the trucking industry’s safety performance. It looks at the most recent data available on truck-related accidents, comparing fatal, injury and property incidents over the last decade. It also brings insight into trucking’s current safety record by looking at Federal records for 2017 through the filter of equipment and fleet operational attributes from the FleetSeek database. And it closes with a proprietary survey examining current and future fleet adoption of various advanced safety system technologies. This report is available as a PDF document, downloadable immediately upon ordering. ORDER NOW. Q1: Do you currently have any advanced safety systems installed on your trucks (i.e. blind spot monitoring, lane departure warning, collision mitigation systems, smart cruise control, air disc brakes, electronic stability control, forward video monitoring)? Q2: Which of the following safety systems are being used on your trucks? Q3: Have you identified any improvement in fleet safety from deploying these systems? We offer several intelligence reports on topics vital to the commercial vehicle market. Exploring the size and reach of the US CV market, forces driving cyclical CV sales, explanation of the regulatory impact on technology development, and much more. A first-of-its-kind, comprehensive report on U.S. equipment by brand, age, vehicle size, industry and location.